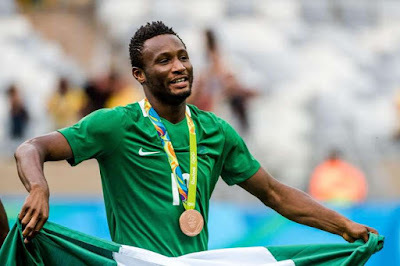 The Nigeria Football Federation on Sunday felicitated with Super Eagles captain John Mikel Obi over his 31st birthday. Born to the family of Mr. Michael Obi in 1987, Mikel began his career in Jos, Plateau State albeit his father hails from Neni in Anambra State. The NFF on its twitter handle: "Happy birthday Super Eagles captain antastic. Have a good one Mikel." The message was accompanied by birthday and stars emoji in celebration of the special occasion for the Tianjin Teda star. The mid fielder played for Plateau United from where then Golden Eaglets coach and former Nigeria international Austin Eguavoen picked him [or the 2001 FJFA U-I7 World Cup. He was a key member of the Nigerian V-20 World Cup two years later in Holland with Nigeria finishing as runners up and the skiLlful star rated by the FlFA technical study team as the tournament's second best player behind Barcelona's Lionel Messi. Mikel was part of Nigeria'S 2013 Africa Cup of Nations winning team and the 2016 bronze winning Olympics squad.